Two watercolours and an engraving in the Wellcome Library show two remarkable people in what is now the the northernmost province of Italy, the South Tyrol (Bolzano-Alto Adige). 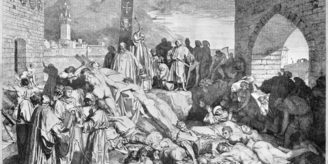 In the 1840s there was a steady flow of foreign tourists and pilgrims to the idyllic valleys of that region solely to visit two women who were said to have received spontaneously bleeding wounds (stigmata) on their hands, feet, or head like those caused to Jesus Christ when he was nailed to the cross and forced to wear the crown of thorns. One of the two women (shown above) was Maria Domenica Lazzari (sometimes spelled Lazzeri), and the other was Maria von Moehrl (also called Mörl). The former was known as L’Addolorata (the woman of pain), the latter as L’Estatica (the woman of ecstasy), for reasons which will become clear. A few words on the topic of stigmatism. From the thirteenth century to the twentieth century there are records of more than 300 cases. Some are relatively recent: they include the English stigmatics Ethel Chapman (1921-1980) and Jane Hunt (b. 1957); the American Cloretta Robinson of West Oakland, California (b. 1962); and the Italian Padre Pio da Pietrelcina (1887-1968). They are overwhelmingly female: among the cases studied by Imbert-Goubeyre were 280 women and 41 men. No authoritative explanation of the phenomenon has been proposed. A rigorous and sophisticated study by René Biot  concluded that in many cases fraud had not been detected, that stigmatism was a “neuropathic phenomenon”, that each case was different and that it was ultimately an enigma. A later study by Ian Wilson  re-examined the cases and proposed that the stigmata may be generated in a rare confluence of four personal traits: in “hysterical” people (1), under stress (2), with strong and overt religious passions (3) and with multiple personality disorder (4), the conditions were present for stigmata to be self-induced by hypnotic suggestion. Various further approaches are found in a volume of essays that appeared in 2001. There is a vast earlier literature, much of it occasioned by Therese Neumann (1898-1962), the controversial (that is, even more controversial than most stigmatics) Bavarian. Many of them combined stigmata with seeingly impossible acts of fasting, such as eating nothing for years. The two with whom we are concerned here are portrayed in two watercolours made in Rome by Luigi Gonzaga Giuditti. He was copying watercolours made in the Alto Adige on 29 and 30 August 1846, by or for Louis Gaston de Ségur (1820-1881). De Ségur was a Catholic apologist and prolific writer against Protestantism and Freemasonry. Let us look first at Maria Domenica Lazzari, and compare Monseigneur De Ségur’s portrayal with the accounts of some of her other distinguished visitors. Maria Domenica Lazzari, L’Addolorata, lived in the village of Capriana (left). There her visitors included, in addition to Louis Gaston de Ségur, John Talbot, sixteenth earl of Shrewsbury (1791–1852), one of the leading Roman Catholic apologists in England, patron of the Gothic revival and builder of the mansion in Staffordshire now known as Alton Towers. He described her (and Maria von Moehrl) in a letter which he published as a pamphlet in 1841. Then, during the summer of 1847, three Oxford-educated young men, Thomas William Allies, the rector of Launton, Oxfordshire, and his friends J.H. Pollen and J.H. Wynne, visited Maria Domenica Lazzari and Maria von Moehrl as part of their grand tour of France and Italy. In 1849 they published a volume of letters from each of the three travellers describing some of the things they had seen. As Wilson says (p. 33), “The Englishmen’s observations are particularly valuable for their cautious, objective and scientific approach.” Let us therefore look at them. The letter from T.W. Allies is typical of the three letters describing the visit of the three Englishmen. It starts in Milan with their visit to the novelist and poet Alessandro Manzoni (1785–1873), author of I Promessi Sposi, to whom they had brought a letter of introduction. We intend to go on towards Venice on Tuesday; we think of stopping at Verona, and going north into the Tyrol, to see the Addolorata, I do no not know if you have heard of her. 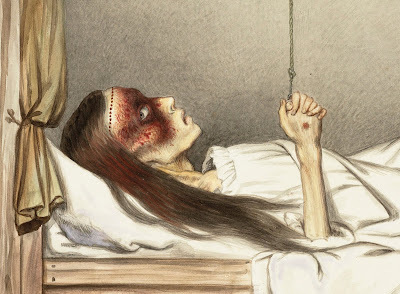 She has now been many years subsisting almost without nourishment, having on her hands, feet, and side the marks of our Saviour’s wounds, and on her head a series of punctures representing the Crown of Thorns. Blood drops from all of these on Friday. I spoke with an eye-witness of this at Paris. The thing seems marvellous enough to go a hundred miles out of one’s way to see it. Yours very sincerely, T. W. ALLIES. Trent, August 1. 1847. MY DEAR — . Since I last wrote to you, I have seen two sights more remarkable than any that ever fell under my own observation before, and than any that are likely to fall again. I mean to give you as short an account of them as will convey a real notion of them. On the 10th of April, 1834, she took a little water with a morsel of bread steeped in it; from that day to this she has taken no nourishment whatever, save the Holy Sacrament, which she receives weekly once or twice, in the smallest possible quantity. Some years ago, when the priest had given her the Host, sudden convulsions came on, and she was unable to swallow It; the priest tried repeatedly to withdraw It, but in vain, the convulsions returning as often as he attempted it, and so It remained forty days, when It was at last removed untouched. We were assured of this by the Prince-Bishop of Trent. 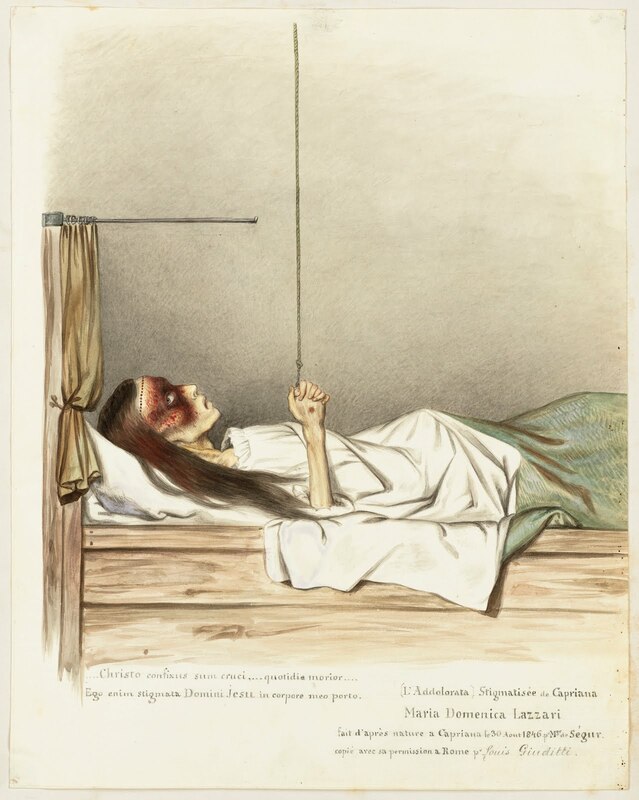 From the time that she first received the stigmata in January, 1834, to the present time, the wounds have bled every Friday with a loss of from one to two ounces of blood, beginning early in the morning, and on Friday only; the quantity of blood which now flows is less than it used to be. 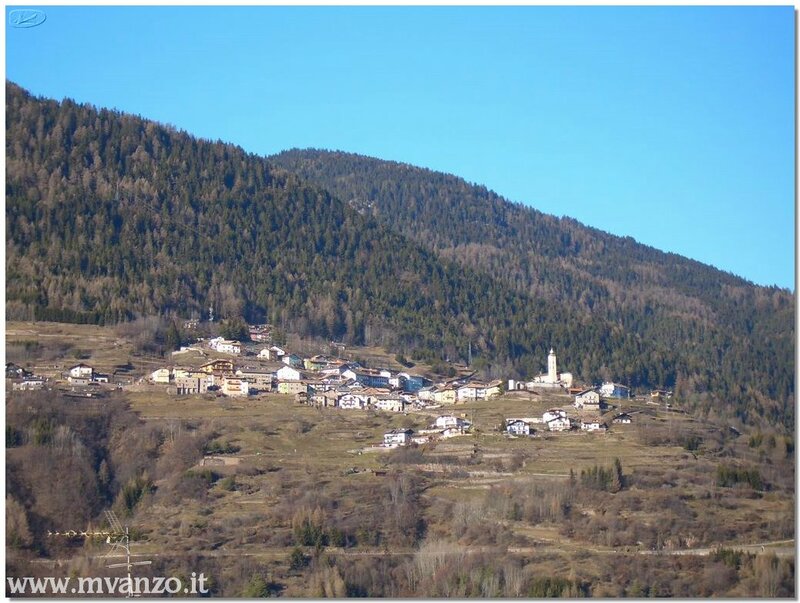 The above information we received chiefly from Signor Yoris, a surgeon of Cavalese, the chief village of the district in which Capriana lies. We carried him a letter from Signor S. Stampa, son-in-law of Manzoni, whom we met at Milan last Sunday, and who had just returned from a visit to Domenica, exactly a week before our own. He appeared quite overwhelmed at what he had seen, and gave us an exact account, which our own eyes subsequently verified. We reached Cavalese from Neumarkt on Thursday, having taken especial care so to time our visit that we might see Domenica first on Thursday evening and then on Friday morning, so as to be able to observe that marvellous flow of blood which is said to take place on Friday. Signor Yoris most obligingly offered to accompany us; accordingly we left Cavalese shortly after one o’clock on Thursday, and reached Capriana by a wild road through a mountainous valley, in four hours. As we got near the place Signor Yoris said, “I will tell you a curious instance of Domenica’s acuteness of hearing. My wife and I were going once to visit her; when we were eighty or a hundred yards from her house, I whispered to my wife to go quietly, that we might take her by surprise. We did so accordingly, but much to our astonishment she received us with a smile, saying that she had not been taken by surprise, and alluding to the very words I had used.” He showed us the spot where this had occurred, and it was certainly an acuteness of sense far beyond anything I can conceive possible. We went straight to Domenica’s cottage, and knocked at the door. Her sister was out, but in a few minutes she came from a cottage a little below, and let us in. At the inner end of a low room near the wall, in a bed hardly larger than a crib, Domenica lay crouched up, the hands closely clasped over the breast, the head a little raised, the legs gathered up nearly under her, in a way the bed clothes did not allow us to see. 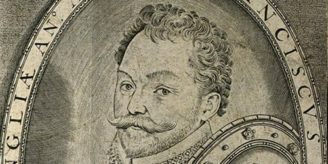 About three quarters of an inch under the roots of the hair a straight line is drawn all round the forehead, dotted with small punctures a quarter of an inch apart; above this the flesh is of the natural colour, perfectly clear and free from blood; below the face is covered down to the bottom of the nose, and the cheeks to the same extent, with a dry crust or mask of blood. Her breast heaved with a sort of convulsion, and her teeth chattered. On the outside of both hands, as they lie clasped together, in a line with the second finger, about an inch from the knuckle, is a hard scar, of dark-colour, rising above the flesh, half an inch in length, by about three-eighths of an inch in width; round these the skin slightly reddened, but quite free from blood. From the position of the hands it is not possible to see well inside, but stooping down on the right of her bed I could almost see an incision answering to the outward one, and apparently deeper. I leant over her head, within a foot of the Corona on the forehead, and closely observed the wounds. She looked at us very fixedly, but hardly spoke. We heard her only cry “Dio mio” several times when her pains were bad. She seemed to enter into Signor Yoris’s conversation, smiled repeatedly, and bent her head. But it was an effort to her to attend, and at times the eyes closed and she became insensible. By far the most striking point in her appearance this evening was that dry mask of blood descending so regularly from the punctured line round the forehead; for it must be remarked that the blood has flowed in a straight line all down the face, as if she were erect, not as it would naturally flow from the position in which she was lying, that is, off the middle to the sides of the face. And what is strangest of all, there is a space all round the face, from the forehead down to the jaw, by the ears, quite free from blood, and of the natural colour : which is just that part to which the blood, as she lies, ought most to run. After about three-quarters of an hour we took leave, intending to return the first thing in the morning. Don Michele Santuari, the parish priest, on whom we called, was out; he returned our visit for a minute or two, very early the next morning, but was going to his brother’s again. Friday evening, July 30th . When we visited Domenica at half-past five this morning, the change was very remarkable. The hard scars on the outside of her hands had sunk to the level of the flesh, and become raw and fresh running wounds, but without indentation, from which there was a streak of blood running a finger’s length, not perpendicularly, but down the middle of the wrist. The wound inside the left hand seemed on the contrary deep and furrowed, much blood had flowed, and the hand seemed mangled; the wound of the right hand inside could not be seen. The punctures round the forehead had been bleeding, and were open, so that the mask of blood was thicker, and very terrible to look at. The darkest place of all was the tip of the nose, a spot, which, as she was lying, the blood in its natural course could not reach at all. It must be observed again, that the blood flows as it would flow if she were suspended, and not recumbent. The sight is so fearful that a person of weak nerves would very probably be overcome by it; indeed, Signor Stampa and his servant were both obliged to leave the room. While we were there Domenica’s sister, who lives alone with her, stood at the head of her crib with her hands under her head, occasionally raising her. We fanned her alternately with a large feathered fan, which alone seemed to relieve her; for she is in a continual fever, and her window remains open day and night, summer and winter, in the severest cold. She seemed better this morning, and more able to speak, and at intervals did speak several times. I asked her to pray for us, she replied, “Questo farò ben volentieri. Prega che l’Inghilterra sia tutta Cattolica, che non ci sia che una religione, perchè adesso ci sono molte.”  She replied, I believe in the very words of the Catechism, “Si; non vi é che una sola religione Cattolica Romana; fuori di questa non si deve aver speranza.”  She observed, that other English had asked the same thing of her. She has light and sparkling grey eyes, which she fixed repeatedly on us, looking at us severally with great interest. We told her that the Bishop of Trent had requested us to call on him, and give him a report of her; and asked her if she had any thing to say. She replied, “Tell him that I desire his benediction, and that I resign myself in every thing to the will of God and that of the bishop. Ask him to intercede for me with the Bishop of all.” I said, ” Piu si patisce qui, piu si gode dopo.” She replied, “Si : si deve sperarlo.”  Before we left, W— repeated, “You will pray for us,” she bowed her head; “and for all England:” she replied, “Quanto io posso. [As much as I can]” After nearly an hour’s stay we took leave, hoping that we might all meet in Paradise. There is an altar in her room, at which Mass is celebrated once a week, and many small pictures of saints. Every thing betokens the greatest poverty. The description of Maria von Moehrl follows in the next instalment. T.W. Allies, Journal in France in 1845 and 1848 with letters from Italy in 1847, of things and persons concerning the church and education, London: Longman, Brown, Green, and Longmans, 1849, pp. 122-136. Available in PDF at http://www.archive.org/details/ra545025900alliuoft , but the OCR “Full text” offered there is corrupt.